Way up north. Sweden. : Done at last. I`m done. Oh that feels so nice, it took me a while this one but I love it, of course. I wasen`t sure about the gray but I think it turned out nicely. Now I`m looking forward to some Christmas projects, it`s getting close now and I never have time to do all the things I want so I better get going. First I need to finish the two quilts I`m making for my kids, I am so going to love tucking them in at night when they have there very own quilt, they are going to love it to, I know. And after that, who knows, I`ll just let the Christmas spirit take me and run with it. I so love Christmas. I need to talk about these two books as well, I am so deeply in love with them, I finished reading them a couple of months ago but I can`t bare to move them from the table by my bed, I love them to much. 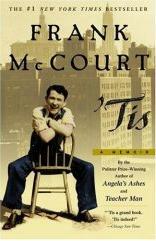 They are both about Frank McCourt, the author, and his childhood in Ireland and America, it was poor and mostly horrible but this little boy sort of went along with it and found happiness and strength as he went along. The books are the sort that make you think and be happy for months, maybe years I don`t know yet. They bring perspective. The best kind. Wonderful quilt! You must feel so proud. How long did you work on it? I recently discovered the one and only quilt I ever tried to make. I worked on it when I was expecting my first child; now she's six! It's still not finished, but I started on it again. 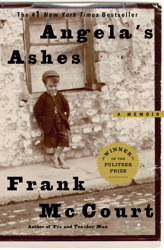 I remember reading 'Angela's ashes', but as with many good books I enjoy: I fly through them and then soon forget what they were like. Maybe I should read these again! Beautiful quilt! And I love the small fingers holding up the edges of the quilt while you photographed it. It made me smile. Such good helpers. Your quilt is GORGEOUS! Good On You! I have to finish crocheting my latest afghan and then I'm going to get quilting! Oh thank you, do you have a blog so I can see what you`re working on? such a beautiful quilt. I love the colours. look forward to seeing all your christmas projects.great blog.thanks.